4. 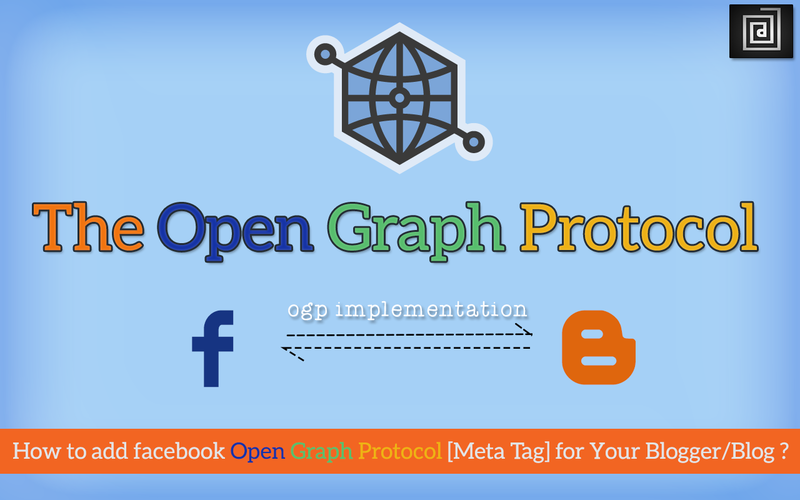 Now you have added Facebook Protocol Tag, lets add Open Graph Meta Tags. 5. Find the code <head> in your blog and paste the following line of codes below it. 6. Here you need to logo-link with Your Blog's Logo link, also you need to replace your app_id and fb_admins respectively and then just hit Save Template. That's it, you have installed Facebook Open Graph for your blogger blog. After some time go to you blog post and try to share it, it will work 100% and hence the facebook share issue will be eliminated. I hope you would have liked above tutorial, Keep Subscribed and Stay connected for more awesome Blogger Tutorials. If you have any problem regarding this post you can drop your comment here or feel free to contact me. Awaysome article brother.. my problem of facebook share not showing thumnail are solved.. thanks a lot.. keep it up with this kind of informative post.. Thanks Kartik bro. I'm glad that your problem is solved. The problem with this is the Facebook Object Debugger says that the 72x72 image provided by data:blog.postImageThumbnailUrl is too small, and therefore Facebook falls back on guessing and substituting a larger image. Which, we know, it's going to screw up in doing. I'm searching for how to get a bigger image, and going by the comments I'm stumbling across others are looking for the same. that's right David, but it also show large images you just need to select other image while sharing your post. Thanks for your responce, will work on it soon. Stay connected. Sure, if I was doing a manual post, yes. But I do automated posts to facebook using dlvr.it. It occurred to me that some of the templates my girlfriend use makes index pages with larger thumbnails. So maybe looking at the code of those templates would give a clue. What if I make a neat graphic for each individual post on my blog and want that graphic to be the default image when my articles are linked to Facebook? How do I make sure the photo I want to be the default thumbnail will be the one that Facebook uses? app_id : you will need to go for Facebook API Developers, build app for your page insights, there you will find app id, I'm gonna soon write an article for it. I didn't figure out the app_id as well, but it doesn't matter cause that f(*&^%in image I wanted to set up eventually shows up!!! Thanks a TON bro! My problem hasn't been solved yet. When I post to Facebook, the article preview still does not show up. Possibly because I didn't input the app id? But where do I get it from? Same problem persists with me as well. When I share my blog on facebook. I get a blank white frame as the thumbnail. Please help. whats the app id, logo id? How can I show thumbnails on feedburner feeds like this: http://feeds.feedburner.com/shoutmeloud ? You will need to add jump breaks in blogger posts, Joseph. Hi there. I have just set up a blog and when I copy and paste the link to a blog post into Facebook, the link works but at the bottom it has my blog name, and then says By Bryan Melgar. The problem is, I am not Bryan Melgar and I know nobody of that name! And I would like to have my name there as I am the one doing the writing! I have no idea where this is coming from and I have checked all the settings in Blogger. Would you be able to help please? Thank you! Natasha Richmond at 8760hrs blog. You need to set up the open-graph properly, If you use the FB debugger you can see all the errors. Bryan is probably the name of the owner of the app id you're using. will work even better (larger image). Will blog posts get shared automatically .. ? ?